1.1.1 (1) Place under each specimen a label showing the locality where caught, the date caught, and the collector's name. Labels should not be larger than 1/4 x 3/4 inches (6 mm x 20 mm). 1.1.2 (2) Identify insects with common names and genus or species level on second labels to be mounted below the first. 1.1.3 (3) Arrange all specimens neatly in an insect box according to orders and families. Orders should be pinned to the box rather than attached to the individual insect pins. 1.2 b. Make colored drawings or paintings of 20 species of insects, representing at least six different orders. Drawings or paintings need to be life size or larger, to show the details of small insects, and in natural coloring. Label the drawings with common names and genus or species level names. 1.3 c. Take color photographs of 20 species of insects, representing at least six different orders. All pictures should be in focus, close-ups and properly labeled, showing where photographed, the date photographed, common names and genus or species level names. 21 2. What are the distinguishing characteristics of an insect? 22 3. Name five species of injurious insects and tell how to control them. 23 4. Name five species of useful insects. 24 5. Tell two Bible stories in which insects played an important part. The Insects Honor is an optional component of the Naturalist Master Award . The Insects Honor is a core component of the Zoology Master Award (available only in the South Pacific Division) . (1) Place under each specimen a label showing the locality where caught, the date caught, and the collector's name. Labels should not be larger than 1/4 x 3/4 inches (6 mm x 20 mm). (2) Identify insects with common names and genus or species level on second labels to be mounted below the first. (3) Arrange all specimens neatly in an insect box according to orders and families. Orders should be pinned to the box rather than attached to the individual insect pins. b. Make colored drawings or paintings of 20 species of insects, representing at least six different orders. Drawings or paintings need to be life size or larger, to show the details of small insects, and in natural coloring. Label the drawings with common names and genus or species level names. c. Take color photographs of 20 species of insects, representing at least six different orders. All pictures should be in focus, close-ups and properly labeled, showing where photographed, the date photographed, common names and genus or species level names. Photographing insects can be challenging, but with a few tips, success is within reach. Perhaps the most important feature of your camera for insect photography is the "macro mode." This feature allows the camera to focus on subjects less than 50cm away. It is often marked on the camera body with a small flower icon (since flower photography is also mostly close-up). If you cannot find how to enable this feature on your camera, consult the user's manual. If you cannot find that, search for one on the Internet. Once you find an insect, you may discover that it moves far too quickly for you to be able to take a decent picture. One trick you can use in this case is to capture the insect and pop it in a refrigerator for about an hour. This will not harm the insect, but it will certainly slow it down. After taking a few pictures, release the insect into the wild again. You can also try placing the insect in a drinking glass, and covering the top with the camera lens and body. Use a transparent glass for this so that light can illuminate the insect. Once it settles down, take the picture. This requirement can really be divided into two phases: field work, and lab work. The field work comes first, and it consists of going out into the wild and finding as many insects as you can. Do not worry about identifying them. Photograph as many as you can. If they are too difficult to photograph, capture them and bring them back to the "lab" where you can refrigerate them as described previously. The "lab work" is when you sit down and attempt to identify the insects you have captured, either photographically, or physically. We present a crude identification guide below, but if you want to identify the insects you find, you will very likely need a good field guide. You can try various on-line identification aids as well, including Bug Guide. Description: Honey bees (or honeybees) are a subset of bees which represent a far smaller fraction of bee diversity than most people suspect; of the approximately 20,000 known species of bees, there are only seven presently-recognized species with a total of 44 subspecies (Engel, 1999; historically, anywhere from six to eleven species have been recognized). These bees are the only living members of the tribe Apini, all in the genus Apis, and all of which produce and store liquified sugar ("honey") to some degree, and construct colonial nests out of wax secreted by the workers in the colony. Other types of related bee produce and store honey, but only members of the genus Apis are considered true honey bees. Description: is one of the biggest and fastest-flying dragonflies, able to reach speeds of 85 km/h (55 mph). This species has several nicknames, including "Darning Needle" for its speed, "Mosquito Hawk" for its predatory habits, and "Lord of June" for its abundance during the summer season. It is also Washington State's state insect. Where found: The Common Whitetail or Long-tailed Skimmer is a common dragonfly across much of North America. 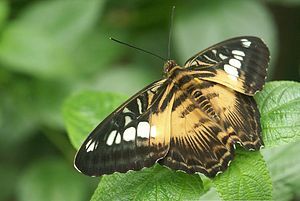 Description: The male's chunky white body (about 5 cm long), combined with the brownish-black bands on its otherwise translucent wings, give it a checkered look. Females have a brown body, and are less noticeable, though they have a similar wing pattern. The Common Whitetail can be seen hawking for mosquitoes and other small flying insects over ponds, marshes, and slow-moving rivers in most regions except the higher mountain regions. Where found: Found in the southeastern and south central portion of the United States. Description: The Eastern lubber grasshopper is the most distinctive grasshopper species within the southeastern United States, and is well known both for its size and its unique coloration. Description: The Phasmatodea are an order of insects, whose members are variously known as stick insects (in Europe), walking sticks (in the United States of America), ghost insects and leaf insects (generally the family Phyliidae). The ordinal name is derived from the Greek "phasma" meaning an apparition or phantom, and refers to the resemblance of many species to sticks or leaves. Some species (e.g. Anisomorpha) are capable of secreting a substance from glands on the metathorax that can cause an intense burning irritation of the eyes (and in some cases temporary blindness) and mouth of potential predators on contact. Description: Cockroaches (or simply "roaches") are insects of the order Blattodea. This name derives from the Latin word for "cockroach", blatta. Among the most well-known species are the American cockroach, Periplaneta americana, which is about 30 mm (1 inch) long, the German cockroach, Blattella germanica, about 15 mm (1/2 inch) long, the Asian cockroach, Blattella asahinai, also about 15 mm (1/2 inch) in length, and the Oriental cockroach, Blatta orientalis, about 25 mm (3/4 inch). Tropical cockroaches are often much bigger, and extinct cockroach relatives such as the Carboniferous Archimylacris and the Permian Apthoroblattina were several times as large as these. Cockroaches are generally considered pests; however, only about 30 species (less than 1%) infest urban habitats. Description: Termites mostly feed on dead plant material, generally in the form of wood, leaf litter, soil, or animal dung, and about 10% of the estimated 4,000 species (about 2,600 taxonomically known) are economically significant as pests that can cause serious structural damage to buildings, crops or plantation forests. Termites are major detrivores, particularly in the subtropical and tropical regions, and their recycling of wood and other plant matter is of considerable ecological importance. As social insects, termites live in colonies that, at maturity, number from several hundred to several million individuals. They are a prime example of decentralised, self-organised systems using swarm intelligence and use this cooperation to exploit food sources and environments that could not be available to any single insect acting alone. A typical colony contains nymphs (semi-mature young), workers, soldiers, and reproductive individuals of both genders, sometimes containing several egg-laying queens. Description: Mantises are notable for their hunting abilities. They are exclusively predatory, and their diet usually consists of living insects, including flies and aphids; larger species have been known to prey on small lizards, frogs, birds, snakes, and even rodents. Most mantises are ambush predators, waiting for prey to stray too near. The mantis then lashes out at remarkable speed. Some ground and bark species, however, pursue their prey rather quickly. Prey are caught and held securely with grasping, spiked forelegs ("raptorial legs"); the first thoracic segment, the prothorax, is commonly elongated and flexibly articulated, allowing for greater range of movement of the front limbs while the remainder of the body remains more or less immobile. Description: Psocoptera are an order of insects that are commonly known as booklice, barklice or barkflies. They range in size from 1–10mm in length. The species known as booklice received their common name because they are commonly found amongst old books — they feed upon the paste used in binding. The barklice are found harmlessly on trees, feeding on algae and lichen. Description: Thrips (Order Thysanoptera) are tiny, slender insects with fringed wings (thus the scientific name, from the Greek thysanos (fringe) + pteron (wing)). Other common names for thrips include thunderflies, thunderbugs, storm flies, and corn lice. Thrips species feed on a large variety of sources both plant and animal by puncturing them and sucking up the contents. A large number of thrips species are considered pests, because they feed on plants with commercial value. Some species of thrips feed on other insects or mites and are considered beneficial, while some feed on fungal spores or pollen. So far around 5,000 species have been described. Thrips are generally tiny (1 mm long or less) and are not good flyers, although they can be carried long distances by the wind. In the right conditions, many species can explode in population and swarm everywhere, making them an irritation to humans. Description: As lice spend their whole life on the host they have developed adaptations which enable them to maintain close contact with the host. These adaptations are reflected in their size (0.5–8 mm), stout legs, and claws which are adapted to cling tightly to hair, fur and feathers, and that they are wingless and flattened. A louse egg is commonly called a nit. Lice attach their eggs to their host's hair with specialized saliva which results in a bond that is very difficult to separate without specialized products. Living lice eggs tend to be pale white. Dead lice eggs are orangeish. Description: Beetles are a group of insects which have the largest number of species. They are placed in the order Coleoptera, which means "sheathed wing" and contains more described species than in any other order in the animal kingdom, constituting about twenty-five percent of all known life-forms. Forty percent of all described insect species are beetles (about 350,000 species), and new species are frequently discovered. Estimates put the total number of species, described and undescribed, at between 5 and 8 million. Beetles can be found in almost all habitats, but are not known to occur in the sea or in the polar regions. They interact with their ecosystems in several ways. They often feed on plants and fungi, break down animal and plant debris, and eat other invertebrates. Some species are prey of various animals including birds and mammals. Certain species are agricultural pests, such as the Colorado potato beetle Leptinotarsa decemlineata, the boll weevil Anthonomus grandis, the red flour beetle Tribolium castaneum, and the mungbean or cowpea beetle Callosobruchus maculatus, while other species of beetles are important controls of agricultural pests. For example, coccinellidae ("ladybirds" or "ladybugs") consume aphids, scale insects, thrips, and other plant-sucking insects that damage crops. Description: The Strepsiptera (known in older literature as twisted-winged parasites) are an order of parasitic insects with nine families making up about 600 species. Their hosts include bees, wasps, leafhoppers, silverfish, and cockroaches. Male Strepsiptera have wings, legs, eyes, and antennae, and look like flies, though they generally have no useful mouthparts. Females, in all families except the Mengenillidae, never leave their host and lack wings and legs. Males have a very short adult lifetime (usually less than five hours) and do not feed as adults. Many of their mouth parts are modified into sensory structures. Description: Raphidioptera are characterized by having an elongate prothorax but no modification of the forelegs (as in Mantispidae). Females typically have a long ovipositor. The two extant families of snakeflies are the Raphidiidae and Inocelliidae. They are all predatory, both as adults and larvae, and in North America occur exclusively in the Western United States, but also occur throughout temperate Europe and Asia. They can be quite common. Megaloptera, from the Greek words mega, meaning large, and ptera, meaning wing, undergo the most rudimentary form of complete metamorphosis among the insects (there are fewer differences between the larval and adult forms of Megaloptera than in any other order of insects), and their aquatic larvae dwell in fresh water, around which the adults also live. Females lay their eggs in large masses on vegetation that is proximate to water. The larvae are carnivorous, possessing strong jaws that they use to capture other aquatic insects. They grow slowly, taking several years to reach the last larval stage. When they reach maturity, the larvae crawl out onto land to pupate in damp soil or under logs. The short-lived adults emerge later to mate - many species never feed as adults, living only a few days or hours. The most well-known of the Megaloptera is probably the dobsonfly, in which males have tusk-like mandibles - but while formidable in appearance, they are relatively harmless to humans, as well as all other organisms. These huge mandibles, much like a peacock's feathers, serve no purpose other than to attract mates. Hellgrammites, which are dobsonfly larvae, are often used for bait. There are about 300 known species. Description: The insect order Neuroptera, or net-winged insects, includes the lacewings, mantidflies, antlions, and their relatives. The adults of this order possess four membranous wings, with the forewings and hindwings about the same size, and with many veins. They have chewing mouthparts, and undergo complete metamorphosis. The larvae of most families are predators. Many chrysopids eat aphids and other pest insects, and have been used for biological control (either from commercial distributors but also abundant and widespread in nature). Larvae in various families cover themselves in debris (sometimes including dead prey insects) as camouflage, taken to an extreme in the ant lions, which bury themselves completely out of sight and ambush prey from "pits" in the soil. Larvae of some Ithonidae are root feeders, and larvae of Sisyridae are aquatic, and feed on freshwater sponges. A few mantispids are parasites of spider egg sacs. As in other orders, there is a pupal stage, generally enclosed in some form of cocoon composed of silk and soil or other debris. Adults of many groups are also predatory, but some do not feed, or consume only nectar. Description: Mecoptera (from the Greek: meco- = "long", ptera- = "wings") are an order of insects with about 550 species in nine families worldwide. The Bittacidae, or hangingflies, are a prominent family of elongate insects known for their elaborate mating rituals, in which females choose mates based on the quality of gift prey offered by various males. Description: Fleas are external parasites, living off the blood of mammals and birds. Fleas are small (1/16 to 1/8-inch (1.5 to 3.3 mm) long), agile, usually dark colored (for example, the reddish-brown of the cat flea), wingless insects with tube-like mouthparts adapted to feeding on the blood of their hosts. Their bodies are flattened side to side, permitting easy movement through the hairs or feathers on the host's body. Their legs are long, the hind pair well adapted for jumping (vertically up to seven inches (18 cm); horizontally thirteen inches (33 cm) - around 200 times their own body length, making the flea the best jumper out of all animals (in comparison to body size). The flea body is hard, polished, and covered with many hairs and short spines directed backward, allowing the flea a smooth passage through the hairs of its host. Besides the problems posed by the creature itself, fleas can also act as a vector for disease. For example, fleas transmitted the bubonic plague between rodents and humans by carrying Yersinia pestis bacteria. Description: The presence of a single pair of wings distinguishes true flies from other insects with "fly" in their name, such as mayflies, dragonflies, damselflies, butterflies, etc. It is a large order, containing an estimated 240,000 species of mosquitoes, gnats, midges and others, although under half of these (about 120,000 species) have been described. It is one of the major insect orders both in terms of ecological and human (medical and economic) importance. The Diptera, in particular the mosquitoes (Culicidae), are of great importance as disease transmitters, acting as vectors for malaria, dengue, West Nile virus, yellow fever and other infectious diseases. The larvae, caterpillars, have a toughened head capsule, chewing mouthparts, and a soft body, that may have hair-like or other projections, 3 pairs of true legs, and additional prolegs (up to 5 pairs). Adults have two pairs of membranous wings covered, usually completely, by minute scales. In some species, wings are reduced or absent (often in the female but not the male). Antennae are prominent. In moths, males frequently have more feathery antennae than females, for detecting the female pheromones at a distance. Insects possess segmented bodies supported by an exoskeleton, a hard outer covering made mostly of chitin. The body is divided into a head, a thorax, and an abdomen. The head supports a pair of sensory antennae, a pair of compound eyes, and mouth parts. The thorax has six legs (one pair per segment) and wings (if present in the species). The abdomen (made up of eleven segments some of which may be reduced or fused) has respiratory, excretory and reproductive structures. 3. Name five species of injurious insects and tell how to control them. 4. Name five species of useful insects. Although pest insects attract the most attention, many insects are beneficial to the environment and to humans. Some pollinate flowering plants (for example wasps, bees, butterflies, ants). The silkworm has greatly affected human history, as silk-driven trade established relationships between China and the rest of the world. Fly larvae (maggots) were formerly used to treat wounds to prevent or stop gangrene, as they would only consume dead flesh. This treatment is finding modern usage in some hospitals. Adult insects such as crickets, and insect larvae of various kinds are also commonly used as fishing bait. 5. Tell two Bible stories in which insects played an important part. Exodus 8:21-31: God sent a plague of flies on Egypt. Exodus 10:1-18: God sent a plague of locusts on Egypt. Proverbs 6:6-8: The ant "stores its provisions in summer and gathers its food at harvest." Jonah 4:5-11: God used a worm (possibly an insect larva) to teach Jonah about His concern for people. Acts 12:20-23: King Herod was eaten by worms and died.